You are here: Jake's Bones > My unicorn skulls ! I have two unicorn skulls ! Really ! I found this skull in Titus Well wood. It was the first complete sheep skull I found. When I first saw it, it was upside down and it wasn't until I picked it up I realised it was a sheep. But it only had one horn ! Horns are different from antlers because horns never fall off and antlers do. 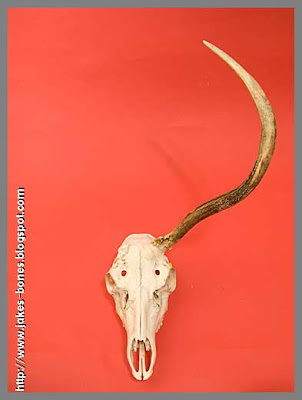 When antlers have finished growing, they are made out of dead bone which is stuck to the skull. When deer die, the antlers don't rot, but when sheep die, the horns get soft and rot down. Horn is made out the same stuff as fingernails and hair and it keeps growing all the time. 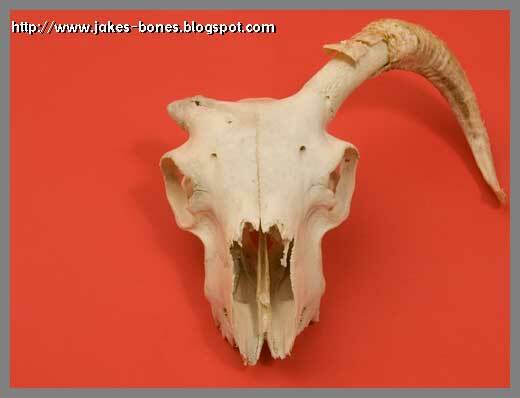 Sheep skulls have bone that the horn grows on, but when the sheep dies, the horn can just be pulled off. Here is where the bit of bone should be on this skull. It looks like it has been broken. Or maybe it didn't grow right when it was younger. I found this next skull in Suicides Graves. It had been shot by poachers and left in one of their pits. It is from an adult red deer. I'm not sure how old it was, but all the teeth were through, and they were still sharp, so I don't think it was very young or very old. It is one of my favourite skulls because it only has one antler, and that antler has grown wrong. It doesn't have any tines coming off it, but it should. Red deer stags have pedicles on top their skull. 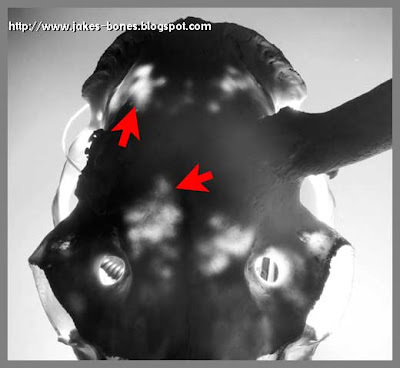 Pedicles are part of the skull that the antlers grow from. 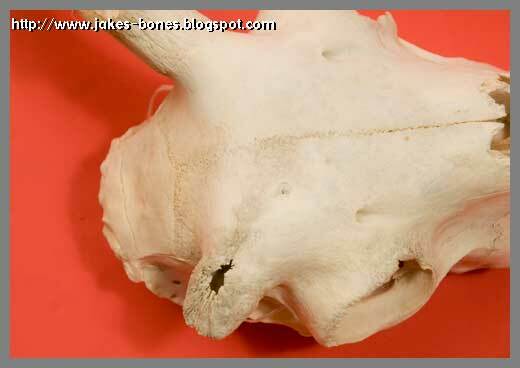 But on this skull the right pedicle has been broken or it didn't grow right. I don't know how it broke but it might have been in a fight or had an accident and that bit of the skull broke. If that had happened, the skull might be thinner on that side. It difficult to measure how thick a skull is, but dad said we shine a bright light through and take a picture to see if one side was brighter and thinner than the other. 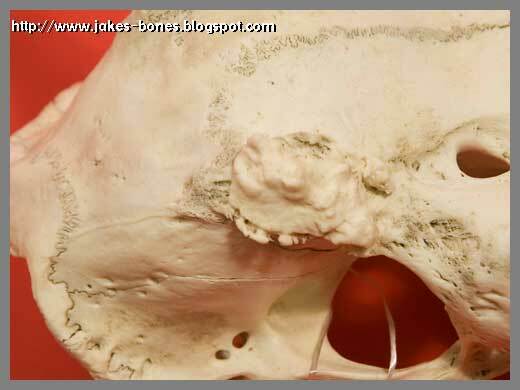 Most of the skull looks the same, but there were two bits that were brighter on one side, meaning the skull was thinner there. It's difficult to know if this means anything because I'm not a scientist (yet!). Here's a story about a real life unicorn from Italy that was a roe deer that had just one antler in the middle of it's head, even though its twin had two. Maybe the skull didn't grow right when it was a baby. That's really cool ! Mine don't have it in the centre. That's really lucky.